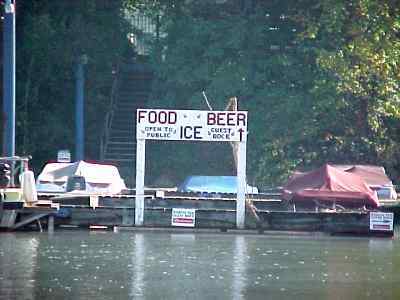 Comments: The folks here are friendly, facilities nice, and the boating supplies outstanding. 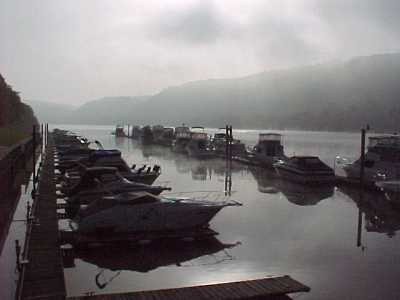 The marina is close to the junction of the Allegheny and Monongahela Rivers, that join to make the Ohio at Pittsburg. Access is easy to all three rivers from this marina. ----- The small town of Aspinwall is an easy stroll away, with stores, P.O., and great restaurants nearby. 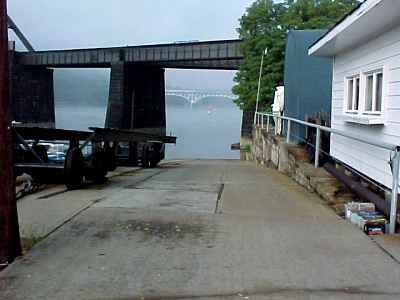 We shoe-horned Halcyon down this ramp and into the Allegheny River. -----The folks at Aspinwall Marina couldn't have been nicer. We stayed several days getting the boat outfitted for the lengthy cruise - and eating some delicious meals at The Luna, a short walk from the marina. Finally, we were ready to go. 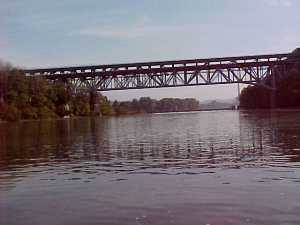 ----"Lets go up the Allegheny as far as the first lock," El suggested. "It isn't far and we'll get a feel of the father of the Ohio." ----- "Good idea. We have the last lock on the Allegheny only a short distance below Aspinwall Marina, so an upriver trip will be a good check out for Halcyon. If all systems are 'go,' we drop down the lock and start the long cruise." ----- The Allegheny rises in Pennsylvania, flows northerly into New York. Only 35 miles from Lake Erie, the route north is blocked by glacial debris. It makes a U-turn back into Pennsylvania. Consequently, those waters must flow over 2,000 miles to the Gulf. Three hundred twenty-five miles from its source, at Pittsburgh, the Allegheny merges with the Monongahela to become the Ohio. ----- There is a long history of human travel along the Allegheny. Native Americans lived, traveled, and flourished along its banks for millennia. European settlers floated down its waters in floatboats - all their earthly belongings in the floating 'house.' When they found a likely place to settle, they moved the house ashore and used every board of the boat for their land home and outbuildings. Later, they built flatboats to carry their produce down river to market. After the introduction of keelboats, goods and people could move up and down the river powered by oars, poles or humans pushing and shoving. The advent of steamboats, in 1823, changed the river. Commerce and passengers could now move upstream from Pittsburg, although navigation was fraught with hazards. ----- Congress in 1879 authorized the removal of boulders and snags from the Allegheny and the construction of dams to create a navigable waterway. In 1938, the last of nine dams and locks was completed. Today, there are eight locks since Lock 1 went under water when a high dam was built on the Ohio downstream. The river is navigable for 72 miles but has little commercial traffic on the upper end. 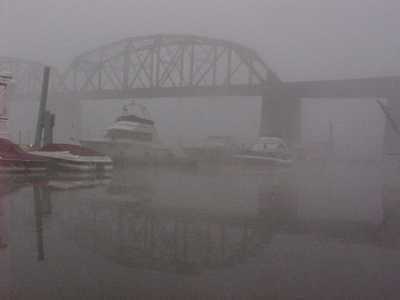 ----- We awoke on our departure morning to a heavy fog. "Hmmm. Thought we had left that behind in Maine," El mused as we ate breakfast. It soon cleared, and we had a delightful morning on our cruise up to the lock. ----- It was indeed a short cruise up to Lock 3, but it was a warm, clear beautiful morning as the fog lifted off the river. High banks bordered the river and it was a marvelous day to cruise. 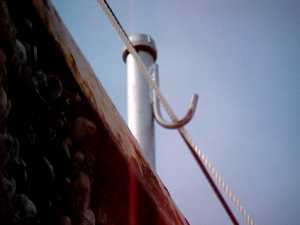 ----- There was a new system of handling lock lines for us to learn. 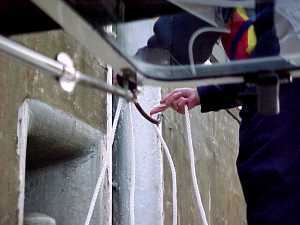 The lockmaster lowered a line with a rather nasty-looking hook on the end. We had a long line cleated off on the stern, and up to El on the bow. 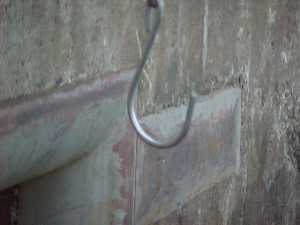 El looped our line through the hook, and, while she held the bitter end, the lockmaster hauled it up and placed it over hooks on the top of the lock wall. 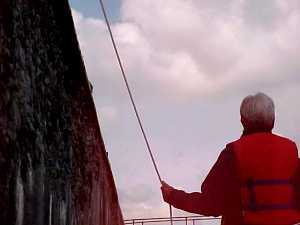 As we dropped with the falling water of the lock, El paid out the line and kept Halcyon under control. ----- As the gates swung open, El released the line, I hauled it in from the stern and, free from encumbrance, Halcyon swung into the current. Our long cruise had begun.